I learned to love avocado when I moved in with my girlfriend around 2012. I’m not an avid lover, like so many others, and I don’t by them too often, but at least a few times every month. And every so often, as I’m making some guacamole or a breakfast sandwich, I get the urge to nurture somehting living, of defying the odds, keeping the seed and making it grow. Now, I’ve tried this many times. For whatever reason, growing avocado trees from seeds has become a popular thing, especially among the more alternative crowds. Most people I know who are vegetarian, goth, punks, disruptors or something else outside of the most narrow mainstream norm have at least tried to grow their avocados. Why? I have know idea. It would be a fun topic for an anthropological essay. But I have not the slightest. They don’t bear fruit, it’s not extremely difficult, they look like a lot of other types of plants. I don’t know. But, like so many of my friends, I have the urge to take on the challenge. 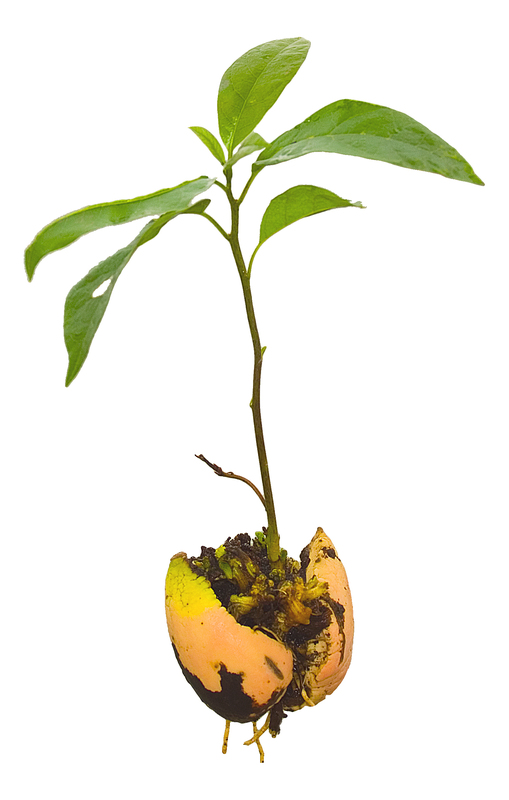 According to every source I can find, there is really only one way to properly grow avocados from seeds. It involves toothpicks, a glass of water and some seed-stabbing action. Basically, you’re supposed to put a couple of toothpicks in the sides of the seed, place it in a glass with the toothpicks holding it up on the sides of the glass, and adding water so that the seed is halfway submerged, maybe a bit more. You should then refill the water every so often as it evaporates and is absorbed into the seed, keeping some sort of delicate balance between drying it out and drowning it. You change the water often, preferably several times a week. You don’t go on vacation. Your life starts to revolve around your seed. You then wait until your grandchildren are old enough to retire and you might see a sprout. If you’re lucky. But you’re not, so the seed molds, you ragequit and don’t try again until you’ve forgotten all about the pains of the past and you decide to try again. Put seed in a glass of water overnight. Put the seed back in water. Keep refilling water to keep the seed fully submerged. Once the seed cracks open all way around, or about 1 centimeter, plant the seed in soil. Keep watering. The root is growing now, enen though you might not see it. Soon you will have a tree. Keep watering a lot. Make sure it always has water. An interesting difference from the toothpick method you will notice is that the seed cracks almost evenly all around. With toothpicks, they tend to crack more at the bottom, and only crack at the top when they are ready to start growing upwards. This delays the process unnecessarily. I have tried for years to make avocados grow the old way, to no avail. So have many people I know. Sometimes, they succeed after many tries, or their seed might crack but not grow a root, or sometimes it takes more than half a year to see any results. So at some point, I decided to try a few angles. I tried doing it the standard way for a few seeds, then putting some seed completely in water, because why not. Turns out, those seeds that where completely submerged cracked pretty fast – within a month. Then nothing happened for a while – until I planted. Then roots came within a week. Soon I had a plant. My toothpicked seeds where still not showing much result, they only opened slightly. I dumped them in water, and now they are really starting to crack up. As soon as I move to the submersion trick, things speed up tremendously. Why have I only ever heard of one method? Who knows? The standard way has something intuitive about it, like planting a seed directly in soil almost. My own pet theory is that someone figured out the standard way, spread the word, and a lot of other people tried. Some failed, some succeeded. Since making them sprout is so hard, I figure most people don’t want to gamble by doing anything but whatever is the standard, tried and true method. This holds up under my own all-the-water-they-can-get hypotehsis: If they are always halfway submerged, that’s enough for them to get going. The many failures me and others around me experience is simply due to a lack of water – halfway submerged might cut it, but might also fall short. So, I have stated an hypothesis. Time to do some more science. I have bought 8 avocados from the same batch. I assume they are from the same manufacturer. I will now let them mature, eat some guaccamole dip and avocado sandwiches1, and do all the seeds in parallel. I will toothpick 4 of them, and submerge 4. I will keep tabs on the dates when the seeds are prepared, when they crack, when I plant them and when they grow roots. When the root is outside of the seed, I will consider a seed to be “done”, since this is when the difficult part of the process concludes. So, in concise form, here is my experiment. I encourage you to replicate it, so that my rather small sample size can be padded with more data. Null Hypothesis: Avocados sprout best when resting on toothpicks stuck in them, halfway submerged in water, tip upwards. Research hypothesis: Avocado seeds frikkin love water, so much that they want as much as possible until they are ready to start growing a root, and therefore sprout best if you just keep them submerged in water until they crack completely open. Details: Both groups will have water changed every week. Avocado seeds are named alphabetically in the order they are retrieved. Naming convention is musicians and bands in my LP rack.